Limerock Gazebos, an Amish gazebo manufacturer in the heart of Amish country, Lancaster County Pennsylvania, was awarded a renewed contract for supplying and making gazebos available to US military bases for another year, and was awarded this contract through their dealer network and association with Specialty Prefab. Gazebo owners can select between wood or vinyl, and can cover the sides with screens or windows. Just covering three sides facing the most common wind direction is usually sufficient. Because side covers are held in place by two vertical slats it’s a simple task to set them up as needed. Vinyl gazebos are similarly equipped. It turns out that, after investigating the matter further, the original posting of the guard was because the gazebo had been freshly painted and they didn’t want anyone accidentally messing up the wet paint. Limerock has been manufacturing and distributing their Gazebo designs nationally through their dealer network for over 20 years. “It’s a family business,” says Ben Stoltzfus of Limerock, who started the business himself. Over the years Limerock gazebos has added to their original gazebo kits product line and offers pergolas, pergola kits, and other outdoor wood structures for almost any need. 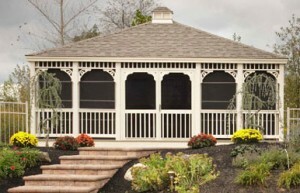 Limerock Gazebos is located in the heart of Lancaster County, PA. This family owned business has been constructing quality gazebos since 1996. The company employs an excellent team of skilled Amish craftsmen (most have grown up on family farms). Their shop is equipped with modern woodworking machinery, ready to handle any custom project. The Limerock Gazebos team is dedicated to the highest standards of quality, in each and every gazebo and pergola, using checklists throughout the process, to ensure customer satisfaction. Specialty Prefab is an authorized dealer for Creative Gazebos™ by Limerock Gazebos, with a network of installers covering all the western states. The company also provides lumber, fencing, steel products, fasteners & other building materials to larger dealers and government contracts. The company has done a great deal of work in Alaska and Hawaii, but has also installed gazebos as far away as West Virginia and South Carolina.